As far as we've come in the years since, with an African American sitting president now in office, Selma is also a timely reminder that we haven't gone very far at all. 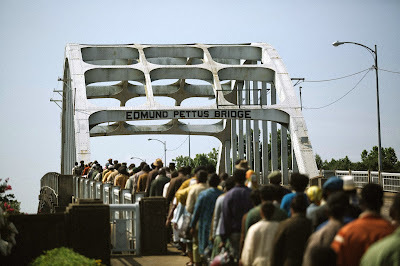 The tempestuous emotions that roil underneath the nonviolent marches, the violent retribution by police who feel their authority is threatened, and the confusion of the average white citizen unable to cope with progress—long overdue but fierce and speedy in its arrival—all characterize the way Selma's cross-section of society reacts to King's effort. But it is just as characteristic of the shootings our own society has been struggling with in recent days: Michael Brown in Ferguson; Tamir Rice in Cleveland; Dontre Hamilton in Milwaukee; Wenjian Liu and Rafael Ramos in Brooklyn. All are symptoms of the tension between those who seek to preserve a power structure that benefits them and the people oppressed at the expense of such a structure. In Selma, violence comes swift and with little warning, even when the moment depicted is a well documented part of history. Then Duvernay extends the moment with slow motion so that the devastation wrought can be felt and contemplated on a deeper level. No one seems to carry the burden of the effects of such violence more than Dr. King. The usually baby-faced Oyelowo has put on some weight, deepened his voice, altered his speech pattern to convey the charisma and fatigue of MLK. 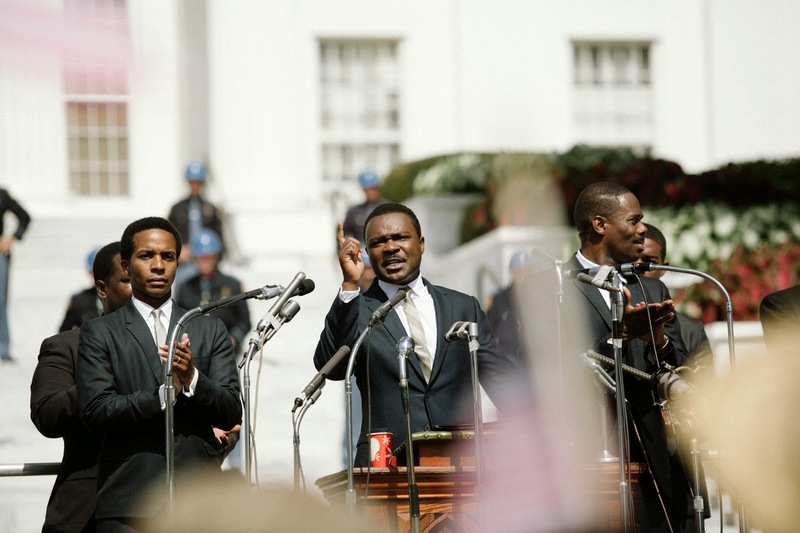 Unable to use King's actual speeches in Selma, Oyelowo is still able to deliver King's righteous indignation in the rhetoric crafted for the film. Duvernay structures Selma like a procedural, with the F.B.I. loglines of J. Edgar Hoover's continual monitoring of Dr. King and his associates serving as both chapter headings and constant reminders of just how revolutionary and threatening these civil rights activists were to the white establishment. There is a constant tension between law enforcement and the people, with government serving as a kind of mediator that isn't always as quick to respond as it needs to be. 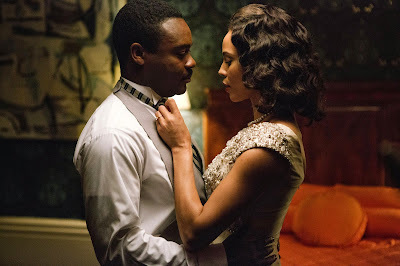 Hoover (Dylan Baker) boasts about all the ways he can bring down powerful men like Dr. King, going so far as to threaten to expose his sexual infidelities to his wife Coretta (Carmen Ejogo). 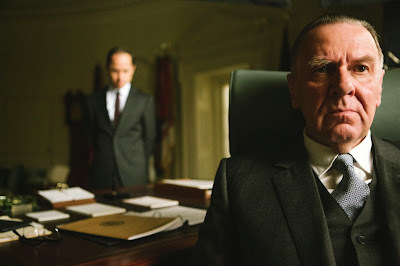 Duvernay doesn't shy away from addressing King's foibles, especially in a powerful scene where Cory, as the onscreen King refers to his wife, confronts a deflated King about his indiscretions. But King is resolute against the threats lobbed at him by Hoover, defiantly holding his ground as he lobbies President Johnson for what will become the Voting Rights Act. 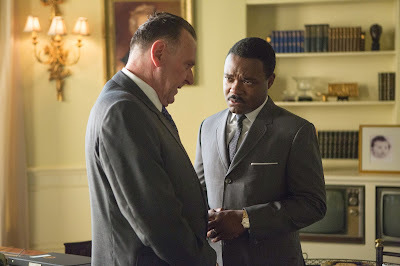 Wilkinson plays LBJ as a man caught in the middle, hailed as a champion by blacks for passing the 1964 Civil Rights Act, hamstrung by bureaucratic red tape when it comes to moving any further, racist enough to refer to King and his constituents by the n-word when meeting privately with Alabama governor George Wallace (Tim Roth), but intelligent enough to realize that his legacy is in jeopardy if he stands in the way of inevitable progress. 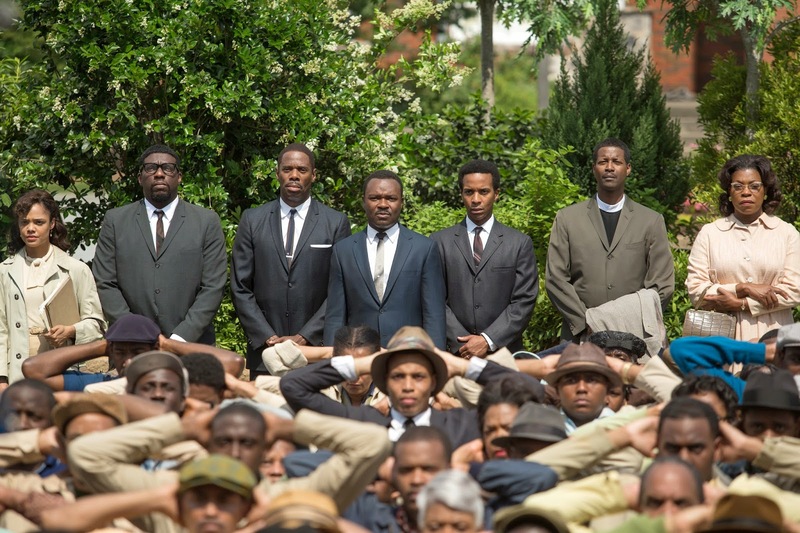 Selma is more successful than most pictures depicting the Civil Rights struggle because Duvernay is able to encapsulate and crystallize the entire era and its players in her depiction of this one pivotal moment. Maybe it's historical perspective that has allowed her to finally deliver a movie that's surely been in the concept stages, if not actually being made, for decades. Anchored by Oyelowo and Wilkinson's fine performances, Selma is educational, inspiring, and ultimately devastating in its portrayal of race relations in America. It is just the mirror America needs during these troubled times.